When I was young I used to love this old documentary titled “Gizmo!”. A bit of a mock-umentary really, it was a collection of newsreel footage from the 30’s – 50’s of people and their strange inventions. Some of them were flying machines, some human powered flying machines. My brother and I would laugh and laugh. In the end Gizmo is a celebration of the crazy dreamers of this world. 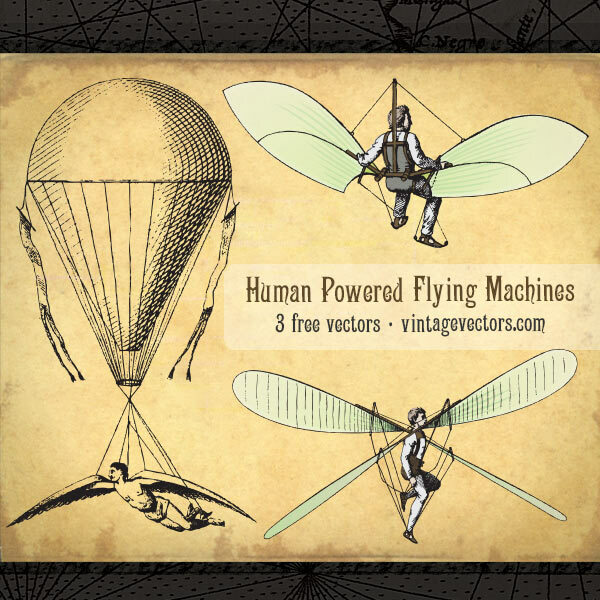 In tribute, these human powered flying machine vector art illustrations are free for the taking. There are three vectors in the set, based on illustrations from 1866. Each one shows a different contraption for winged flight by man. The download has .ai .eps & .pdf versions. Surely human powered flight has been a dream as long as there has been man. I wonder if that old documentary is still out there…. Let’s see…. Oh here it is! Here are some more early flying machine vectors. Thanks for the amazing work! I have one question, most files are licensed for commercial use, after crediting the artist. I’d like to use some of them on t-shirts and credit the artist ofcouse. However, I can’t find the artist’s name! Kindly advise. Thnx. I find it interesting that all of the clips show a device with wings that can be moved. Airplanes’ wings don’t! Thank you for the video and the images!